Happy ☘️St. Patrick's Day! Did any of your perfect traps work? Since children did not wish to catch a leprechaun, we decided to create a sensory Leprechaun Land. Hydrogels can be costly though, so I bought ⚪️clear hydrogels in bulk ~ 1 lb makes 12 gallons😱for only $10~ and then added food coloring! And, the amazing thing is that once colored, the hydrogels do not stain hands or transfer color! For example, we placed DIY blue hydrogels in water, and the water remained clear while hydrogels remained vivid blue! 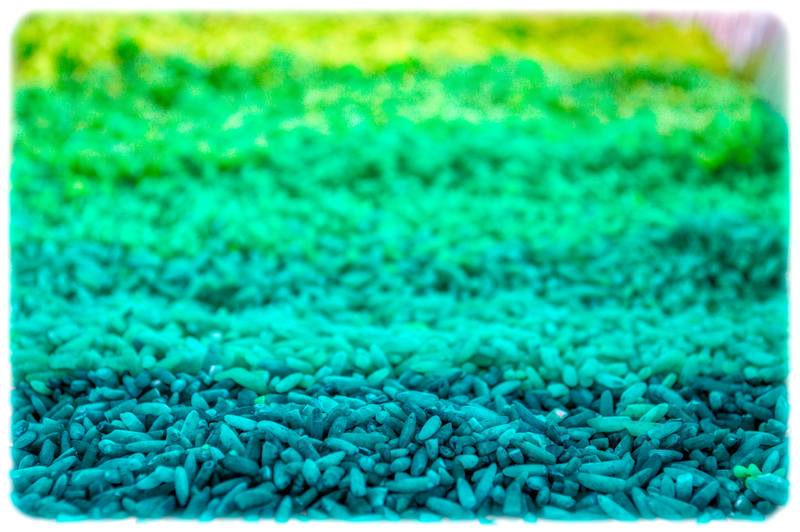 Inspired by the 💚Green book, we are also making shades of GREEN with this DIY rice! Just add a little bit vinegar (we are using a bulb baster for that) and desired food coloring to your dry rice (separate each color in an individual plastic ziplock bag) – mix well, air dry and it is ready to use! Most coloring we used (such as green, seafoam, and turquoise) are from this liquid dye set for soap. We also used a neon green (with a pointy cap) from this food coloring pack, and last one: kiwi green was from this liquid soap set. Did you know that 🇮🇪 Ireland's nickname is 💚 'Emerald Isle’ because of its verdant landscapes and lush 🌱 grass? Also, the color 💚green holds a deeper religious meaning of Catholicism. Green stands for fighting for independence and freedom from 🇬🇧England and to be able to exercise free religious choice. Gold, on the other hand, as seen on the 🇮🇪Irish flag, represents Protestant ruling under the 🇬🇧British Empire, and white stands for hope. Did you know that the original color associated with St. Patrick was not green, but blue! Patrick is shown wearing blue vestments in several artworks. It was not until later that the green color became associated with Ireland due to the beautiful green countryside and the above mentioned religious content. We ended up mixing our DIY blue and green hydrogels to create a pond for a frog to sit on a four-leafed clover. We also use these tree, which I inserted into styrofoam packing rectangles. I thereafter covered everything with our rainbow green rice. About 🎩Leprechauns: According to legend, the leprechaun is a tiny elf, found only in Ireland. Most leprechauns are shoemakers to the Fairies, who pay them gold for their work. The leprechauns, or “little people,” store their gold in pots and often bury one “at the end of the rainbow.” Since leprechauns love more than anything to play tricks, this may just be another one. The gold at the end of the rainbow has not been discovered yet! But if you find a leprechaun and pick him up, he must tell you where his gold is hidden. That is leprechaun law. So look for leprechauns in Ireland near clear springs of water, or close to large rock formations, or at the end of a rainbow. Listen for the sound of tiny hammers tapping, or elfin pipes piping, as soft voices to sing a fairy song. And maybe, just maybe, you will find the leprechauns’ pot of gold! We also experimented with setting up a pond in a shallow dish. Which set up do you like better? And, by the way, a Leprechaun ended up visiting us for a quick bite after all. Children were super 😜 excited to see that he ate all the nuts we left out for him and drank some of his favorite ❤️️dandelion 🍵tea … though spilling most of the tea …He also left gold dusted 👣 footprints all over and two gold coins. We did not catch him on camera though 😬 leprechauns are quick, shrewd and camera-shy❌📸. Have you been 🍀 lucky catching a Leprechaun? See here our entire unit round-up in a post ☘️St. Patrick's Day Inspired Unit Study. 👔Father’s Day ✂️Craft • Daddy, I Love You To The 🌙 Moon & 🚀Back!